Published by the American Geophysical Union as part of the Geophysical Monograph Series, Volume 133. We imagine the reader of this preface standing at the AGU bookstall wondering if the tome in hand is worth buying. The answer is “no”, except for certain trifling exceptions. Those who wish to learn about the exciting pioneering years of LLBL research should buy the book for Tim Eastman's excellent historical review, our opening chapter. When did the term “LLBL” first enter the field? Eastman will tell you, and much else besides. 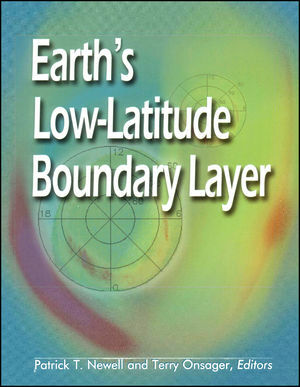 Patrick T. Newell and Terry Onsager are the authors of Earth's Low-Latitude Boundary Layer, published by Wiley. Equator-S Observations of Boundary Signatures: FTE's or Kelvin-Helmholtz Waves?